One of the criminalized statements issued by Don Staniford in his campaign against industrial salmon farming. 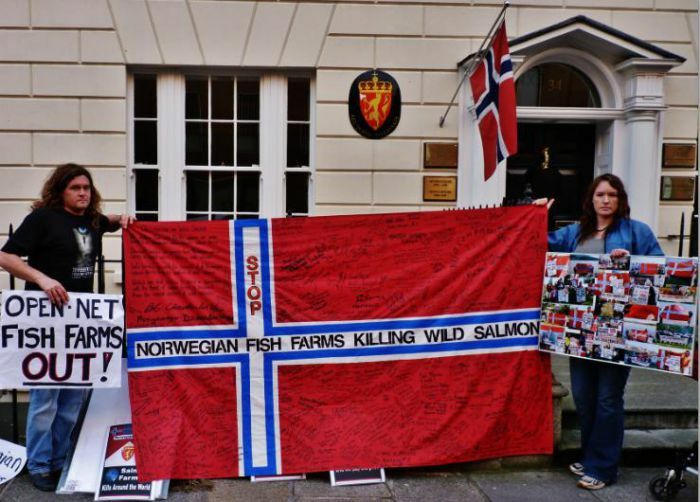 Don and Elena Staniford in Norway focusing attention on the global industry led by Norwegian state-owned operations. In February 2011, Staniford's deportation, following his trial, was marked with a big party of friends and environmental allies giving support and encouragement. In the hopes of quashing a ruling that muzzles activists, and proving that “salmon farming really does kill,” Don Staniford appealed the BC Supreme Court decision of July 2012 that left him liable for slander and damages to Mainstream, a Norwegian salmon farming company operating dozens of farms on the BC coast. On February 13, 2014, the Supreme Court of Canada (SCC) affirmed the provincial court ruling and denied Staniford leave to appeal the decision against him. Staniford’s legal defense against Mainstream’s charges was largely “fair comment.” His campaign to expose the dangers of industrial-scale farming of European Atlantic salmon in BC, home to Pacific salmon, was dynamic and long. But this foreign-owned company eventually found a way to fire back legally – since they had no intelligible response to the charges of environmental degradation and spreading disease among wild salmon which Staniford had publicly levelled, and which are well documented by biologists around the world. 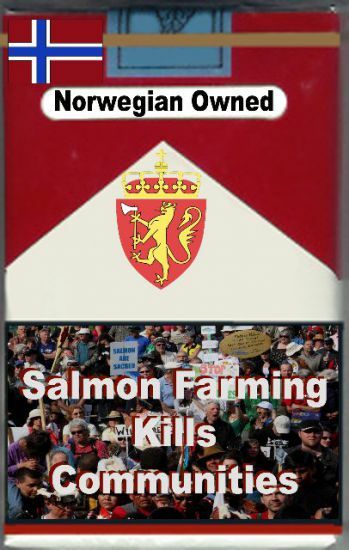 Mainstream had Staniford when he released a series of images on pseudo-cigarette packages, with the blue cross of the Norwegian flag as the brand, and warning labels on the bottom with graphic images of the various victims of salmon farming. The warning labels featured bold print: “Salmon farming kills communities” (which it most certainly has, in Chile in 2007); “Salmon farming harms my global environment” a fact hard to dispute when scientific journals on the subject are given a review. “Cermaq's SLAPP suit is a slap in the face of public dissent and freedom of speech. Shame on the Norwegian Government - as owner of the plaintiff, Mainstream Canada (now re-named Cermaq Canada) - for bankrolling such Draconian legal action. Norway may have a monopoly on salmon farming globally but Norwegian corporations surely cannot be allowed to own the law? That the Canadian legal system has given the Norwegian Government free reign to muzzle freedom of speech speaks volumes of how undemocratic Canada has become under the Harper Government. Freedom of speech and critical dissent is a basic democratic right. “If Cermaq's lawyers and the Kafkaesque Canadian courts want to silence me they will have to drag me kicking and screaming the truth from cyberspace. Thanks to everyone who has supported me financially in this legal battle. 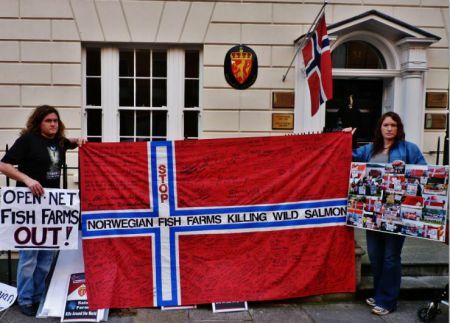 To support the ongoing campaign against Norwegian corporations spreading infectious diseases, draining the world's oceans of wild fish and killing free speech around the globe please Go Fund Me - I promise that not a single cent or kroner will go to fill the coffers of Cermaq, Mainstream Canada or EWOS Canada. The plaintiff's corporate name-changing smacks of a crooked shell game and begs the question: to whom do I write the cheque?" Staniford has been charged to pay damages to the company and their costs in the legal dispute – a combined amount in the range of $500,000. When he appealed to the public for funds to carry out his original defense, late in 2011, the entire bill was paid - $100,000. Much of this money was fronted by recreational fishermen’s associations and businesses in BC, BC wilderness guide outfitters such as bear and whale watching tours, and even The Wild Salmon Warriors of Norway. Staniford’s statements of condemnation against the mostly Norwegian industry are hardly unsupported. In 2008, salmon biologists Jennifer Myers and Ransom Ford published a researched paper in the scientific journal “PLOS biology,” A Global Assessment of Salmon Aquaculture Impacts on Wild Salmonids. Their study found an average decline of 75% among wild fish stocks everywhere the open-net-cage salmon farms had been introduced. These findings are loud and meaningful in British Columbia, where wild salmon returning to the Fraser watershed have been reduced to 1% of historical run sizes, as of 2009. Large-scale salmon farming began on the migratory route of these salmon in the mid-1980s. Reaction to the public information campaign from Indigenous Peoples and British Columbians was decisive, as thousands rallied in front of the BC Legislature in 2009 to demand changes to salmon farming regulations, such as not importing eggs from Norway which might harbour Infectious Salmon Anemia virus (ISAv), and in the Fall of 2010 thousands more participated in a week-long voyage by canoe down the lower Fraser to Vancouver in the second Paddle for Wild Salmon where they finally marched on the Cohen Commission demanding the release of disease records in salmon farms, and won that concession which had previously been withheld from the federal inquiry. The Cohen Commission continued to be a key theatre for revelations of the BC salmon farming industry, which includes one hundred open-net-cage farms on the wild salmon migration route. Heart stopping evidence of polluting with abandon, of massive ocean dumps of salmon which had died of disease, and of serial government indifference came out in this Inquiry. With inevitable consistency first Canada, then British Columbia, then the BC Salmon Farmers' Association would proceed to the podium to object to any and every shred of evidence, expert opinion or even reasonable question as to the culpability of their operations in the collapse of Fraser sockeye. Other than their insistence that Atlantic salmon feedlots have no significant relation to the decline, Canada had no opinion to offer Justice Cohen as to their regulation: "I'm sure the Salmon Farmers and the province can respond to the aquaculture issues," lawyer Mitch Taylor summarized for the state. If Don Staniford can be sued for half a million dollars for pointing out that the one hundred open-net-cage Atlantic salmon farms on BC’s coast are killing inestimable numbers of marine species, poisoning the coastline and marketing a product which is well known to be carcinogenic, who else among us is going to continue to say so? In spite of overwhelming scientific evidence in support of this position? It looks like HSBC’s advertising in the airports is true: “In the future, the food chain and the chain of supply will merge.” The picture attached to this particular billboard in the HSBC series is one of a chinook salmon. It has a bar code overlaid on its back-end, and a closer inspection of the poster reveals that this fish is bleeding around its fins – pinpoints of red on the body side of the dorsal and lower body fins, which are only found in infected salmon-farmed salmon. If in the future the chain of supply and the food chain merge, as HSBC predicts, and the food chain / chain of supply includes farmed salmon, and farmed salmon are as much a threat to living ecosystems then as they are now, how will we all live? Ransomed to eat from a chain of supply which does not allow comment on the toxic and carcinogenic animals which are available to us for food, and which deprive a natural world of the species that living systems require to sustain life on this earth? It’s not only that Staniford can’t say “salmon farming kills, like smoking,” there are altogether 52 statements which BC Supreme Court and now the Supreme Court of Canada have declared he may not make. The 52 statements are cited via http://donstaniford.typepad.com/my-blog/2014/02/towhomdoiwritethecheque.html. If the BC salmon farmers are to continue protecting themselves from public scrutiny and comment, they are going to have plenty more cases. A documentary film on the colonial governments of Canada’s collaboration with salmon farming companies, especially in the person of the Canadian Food Inspection Agency (CFIA), offers enough evidence to put the SCC’s decision into question. Salmon Confidential, by Dr. Alexandra Morton and Twyla Roscovich, chronicles unfathomable indulgences by government agencies. The appearance of bias in favour of salmon farming comes across in technicolour as twitching CFIA witnesses at the Cohen Commission (see below) make statements that beg the definition of common words; as Fisheries and Oceans Canada cover up positive finds of European-originated ISAv in wild salmon; as the international OIE lab in Prince Edward Island which made the finding, and Dr. Fred Kibenge, are de-licensed. The film makers show themselves ordering fresh-frozen farmed salmon in sushi restaurants in BC, and then testing the carefully removed samples for disease. The farmed salmon sushi tested positive for three diseases fatal to wild salmon. Staniford’s campaigns in BC, mostly unfunded, included partnerships with multiple environmental organizations to expose the discovery of Infectious Salmon Anemia virus in wild Pacific salmon in 2011; persistent and prolific letters to media and politicians; blogging about developments in various legal proceedings against salmon farms globally and operating a news list-serve. In the past fifteen years, Staniford has traveled to Norway to confront shareholders, he co-wrote Stain Upon The Sea, with Alexandra Morton, he helped organize mass public marches in response to publicity about the actual damages caused by salmon farms on the coast, and traveled extensively throughout the interior Fraser watershed to meet with Indigenous fisheries experts as well as area-based salmon conservation groups. All those groups are unlikely to forget what they saw in the pictures, videos and scientific reports concerning the dangers of industrial salmon farming in coastal waters. The Global Alliance Against Industrial Aquaculture, Staniford’s organization, remains at work to remove the threat of these salmon farms from the world’s precious, life-giving coastal waters. Presently in Scotland Staniford wages a debate against a new political party’s bid for Scottish secession from the UK – a change which includes mass salmon farming and wind power as the economic platform to bankroll its autonomy. In Canada, the Harper government has launched an assault on environmental charities in the form of blanket tax audits.